For those of you who have been following other news, it saddens me to report that Glen Bell, creator of Taco Bell, died Sunday at the age of 86. No cause of death was mentioned, because honestly, I think we can all figure that one out. Glen Bell was an innovator, who taught millions of Americans to "think outside the bun." Taco Bell started back in 1962, WAY before people were sick of hamburgers, so you can imagine how hard this guy had to work to earn a buck. Eventually he sold out to Pepsi, which is right about when you started seeing Taco Bells every 60 yards or so. But Glen Bell was the first guy to say, "Screw that hamburger noise. I'm packin' this junk into a tortilla. Quick, give me some lettuce and tomato!" And that's been their business model ever since. Taco Bell sports a menu with myriad options but every single one of them consists of meat, beans, and cheese with either lettuce, tomato, or both. That's it. Sometimes it's shaped like a taco, or nachos, or a chalupa (whatever the hell that is), but the end result is the same: diarrhea and a solemn oath never to eat there again. You have to admire a "restaurant" that establishes the concept of "4th Meal." You know 4th Meal, right? That time late at night, after your dinner, y'know, when you get really hungry for some low grade food for no reason. Right? Oh, Taco Bell, do you mean when I'm blind drunk taking a taxi cab home? Is that the time you're referring to? Or maybe it's when the bong haze clears and I've developed eye strain from seven and a half hours of Warcraft. Because I've checked and I don't know of many people who spontaneously crave 1/3 lb burritos at midnight unless some sort of intoxication is involved. But sure, we'll go with 4th Meal, because "For When You're Just F*&$%d Up" wasn't as catchy. But I digress. Iron Horse Helmet dedicates this Orange Flame Neoprene Face Mask to the memory of Glen Bell and all the times he's bailed us out: after a party, coming home from a bar, on your lunch break when you forgot to get cash so you only have $2.78, and every night after the pizza place blacklisted you for freaking out the delivery guy when you accidentally answered the door with no pants. 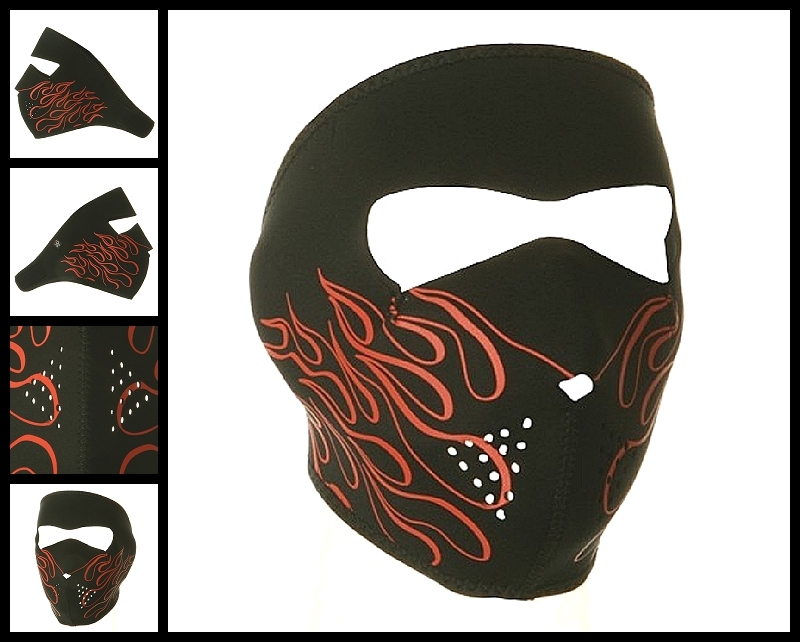 Our Orange Flame Neoprene face mask features full coverage of the face and ears. Stretchy neoprene material is warm and water resistant. Patterns are reversible to solid black material. Velcro closure ensures great fit with goggles, with a helmet or without. One size fits most.